With our night in the airport hotel in Keflavik, we all enjoyed sleeping in an actual bed, that didn’t move around in the wind, and with room to move. Although there was definitely not enough sleep as the alarm rudely went off at 6am! We were quickly up and dressed and down to breakfast, which was conveniently on our floor of the hotel. It was our one and only Iceland hotel breakfast and the kids found some waffles and fruit (unsurprisingly they declared the fruit not good since it was obviously imported and from cold storage). We were looking forward to fresh fruit and veggies again. We had to speed through breakfast and grab our bags and be down ready for the 7am shuttle to the airport. The shuttle left promptly seconds after we boarded and it was a quick drive to Keflavik airport. The airport had way less snow than when we arrived 9 days earlier. It has certainly warmed up in this part of Iceland, over the past week or so. Our flight was 9.10am on Easy Jet and we’d managed to re-pack our bags under the weight and size limits such that there was no drama with them……. unlike pretty much everyone else checking into our flight. Through security, and then it was off to check out the souvenirs and buy a few more small items before changing the last of our cash. Like other Scandinavian countries cash wasn’t really necessary and we’d taken out only a bit of extra cash over the amount necessary for the motor home, and had barely touched it in 9 days. Even the campsites usually took credit card. Then entire last day we tried to pay cash for everything and still ended up changing some over to pounds. We were quickly through immigration and down to the gate for our flight. The flight was 2 hours 20 minutes and left on time and was drama free, despite Easy Jet being renowned for running late and having problems. After 9 long and hectic days in Iceland the kids were tired, but sadly didn’t manage to nap on the flight as it was a little early in the day. It was going to be a long day ahead given our level of exhaustion. 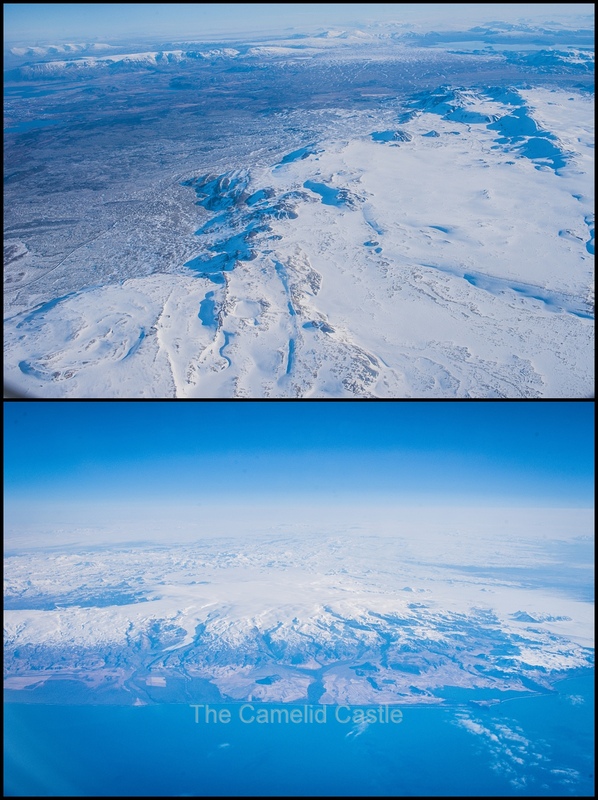 The flight out of Iceland was just as spectacular as the way in, although our level of enthusiasm for snow had dropped by now! Due to the time change back to the UK we were off the flight around 12.30pm. Once we got through immigration (we were really racking up the immigration stamps on this trip) and got our bags we then had to walk up to the car hire area. As Anto was working in Glasgow for the week, we had a car organised through his work. The car was ready and waiting and was rather new and shiny Peugeot 308. The kids really liked the sunroof which seemed counter intuitive in Scotland, with its general lack of sun! As we’d bought our car seats with us from France, via Iceland, we just had to dig them out from the bag we had them in. We’d stuffed them with dirty clothes to make the weight and size limits for bags so it was a fun process unpacking that in the rental car car-park! By 1.30pm we were ready to hit the road. Anto did well to adjust to a more responsive car (after driving the huge motor home for 9 days) and we were back on the ‘correct’ side of the road, just as we’d gotten used to driving on the opposite side of the road. 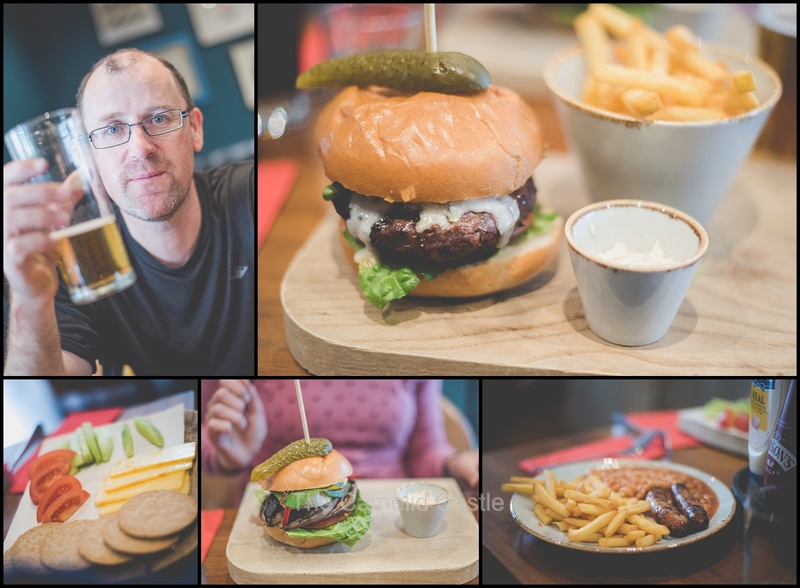 We had decided to head towards Edinburgh castle and find somewhere for lunch before a little sightseeing around Edinburgh. 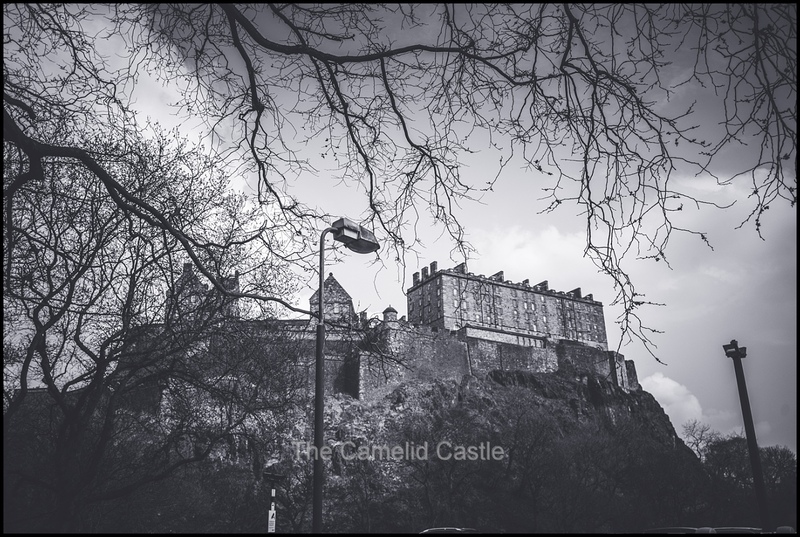 Luckily the castle is pretty easy to spot, perched up on the hill, once you are in the right area. Traffic on a Sunday afternoon in the old town area wasn’t the best but we managed to find a free park right near the castle. A quick google search showed a nice pub just around the corner, it had now been a long time since the 6am breakfast (and there was no complementary food on Easy Jet being a low-cost carrier) so we were all well and truly ready for lunch. After 10 days of living off porridge, pasta and toasted sandwiches I nearly fell over with excitement when there were lots of vegetarian options and they actually had veggies. It was now 2.30pm in the afternoon so it wasn’t that busy in the pub. Anto ordered a local beer and a deer burger. I had a mushroom and goats cheese burger. Soren, had a kids lunch plate with cucumber, cheese, tomato and oat cakes and Astrid a kids sausage and beans. All a bit hungry it certainly hit the spot. The kids had to try all the sauces on their meals. They are big fans of mayo on fries after Belgium but gave Brown Sauce the thumbs up too. I’ll admit Brown Sauce isn’t too bad despite it’s look and name! Despite all mostly wanting a nap we figured we should do a little Edinburgh sightseeing before having to head to Glasgow for the week. 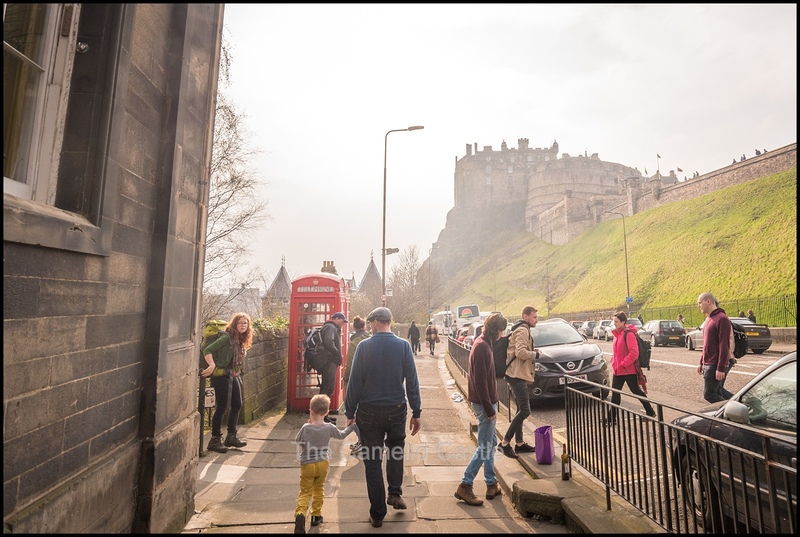 We walked back past the car and continued on foot up to Edinburgh Castle. All enjoying the fresh air and mild temperatures. Unlike Iceland there were plenty of flowers out in Edinburgh, being mid-Spring. It was only 2.5 hours on a plane from Iceland, but Scotland is so different. It always blows my mind how you can end up somewhere so amazingly different in just a few hours travel. 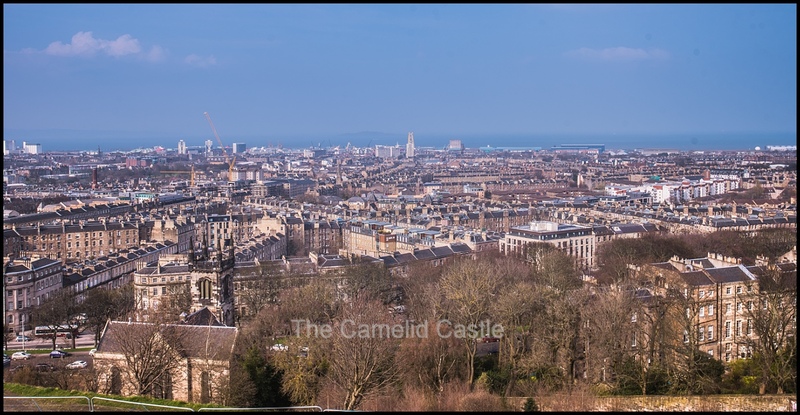 We wandered up to the Castle and had a look at the front (free) section and checked out the views across the city from either side of the hill. 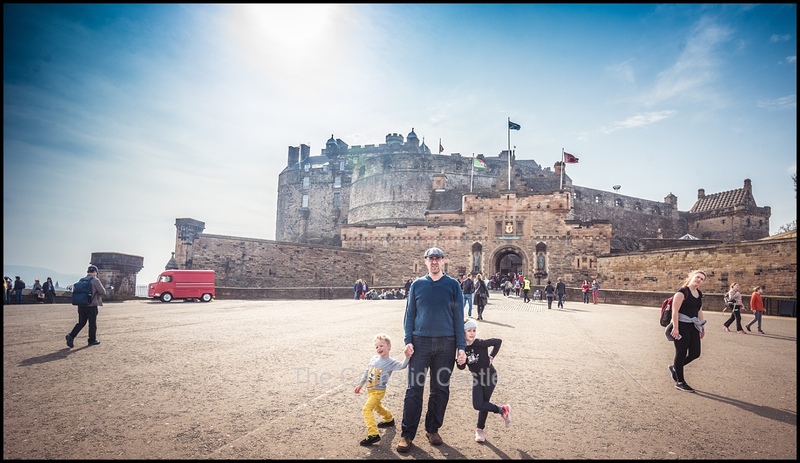 We were originally planning to go into the castle but it was now mid-afternoon and we had a lot of sight-seeing still to do before the drive to Glasgow, so we opted to spend the time out in the sunshine and just checked the castle out from the front. It was warm rather warm (especially after Iceland) at around 16 degrees Celsius, so we even got jumpers off which was an unexpected treat. 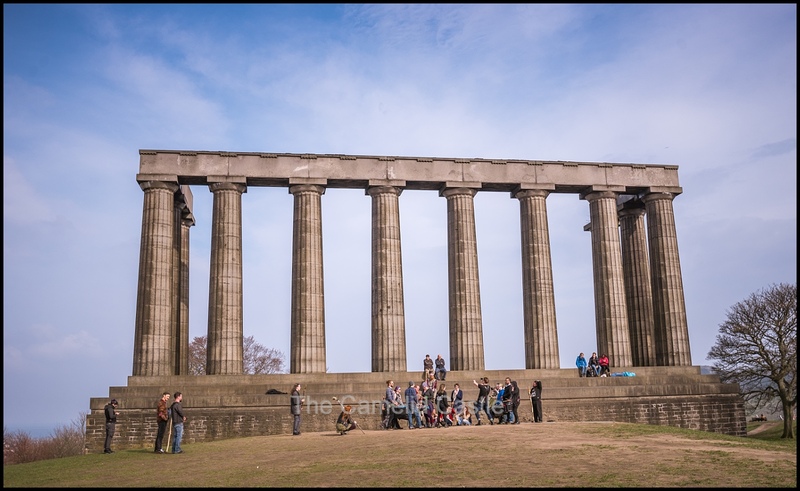 Even the locals seemed surprised at the unseasonably warm weather, it was Scotland after all! 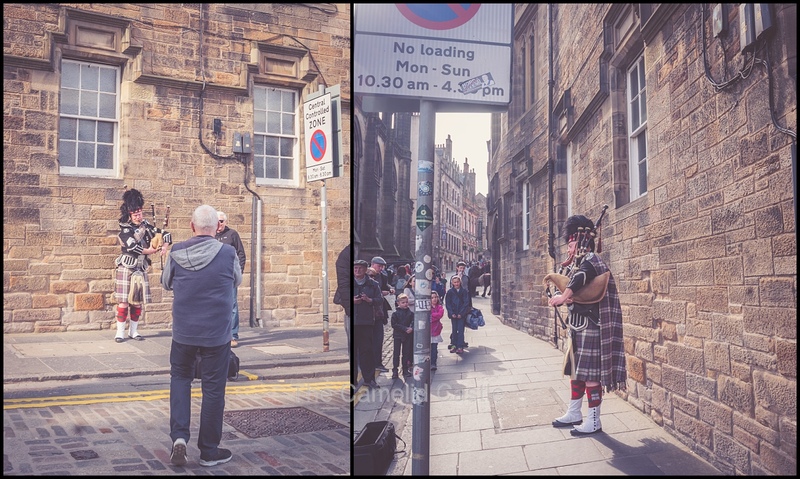 As we headed away from Edinburgh Castle we walked up the Royal Mile. The kids had never seen or heard bagpipes, and pretty soon we stumbled across a piper, which found fascinating. We also came across an owl which was a little weird, but amused the kids. 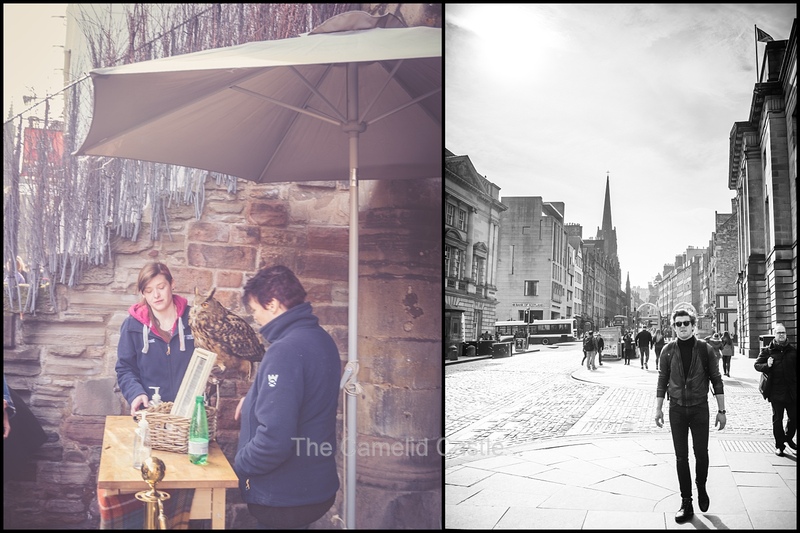 The Royal Mile was almost entirely cafes, restaurants and lots and lots of souvenir shops. We convinced the kids we had plenty of time for Scottish souvenirs later but Soren already found lots of things in windows he wanted. 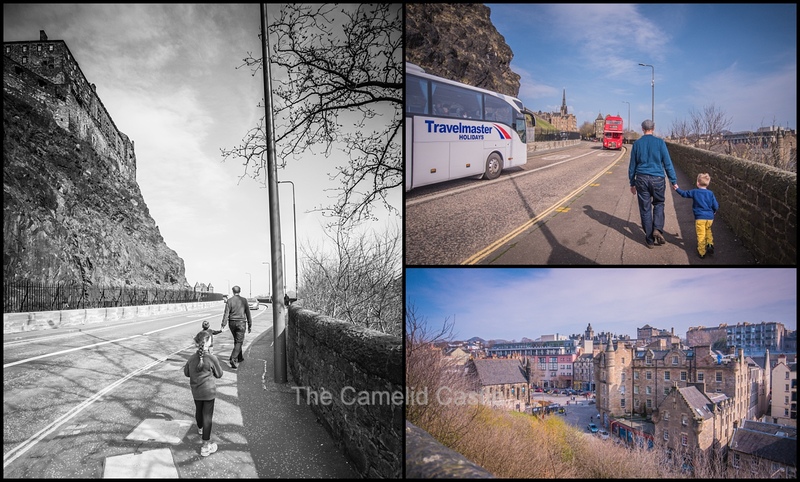 From the Royal Mile, we walked over North Bridge up to Calton Hill. There were lovely views as we walked up but we did notice the city is entirely covered in construction. 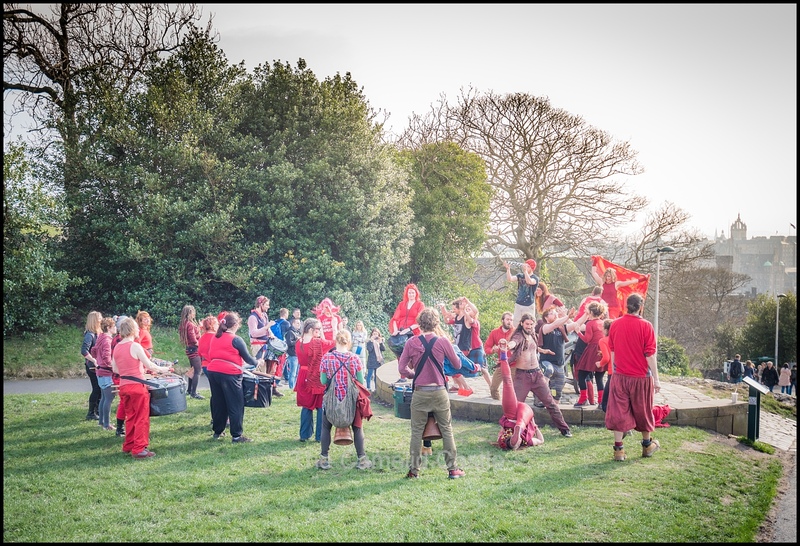 When we made it up to Calton Hill, there were at least 5 different drumming and dancing groups performing in different locations all over the hill. It was entertaining even if we had no idea what they were doing or why. Possibly just enjoying the Sunday afternoon Scottish sunshine, but there seemed to be dance-offs and drum-offs going on all over the hill. 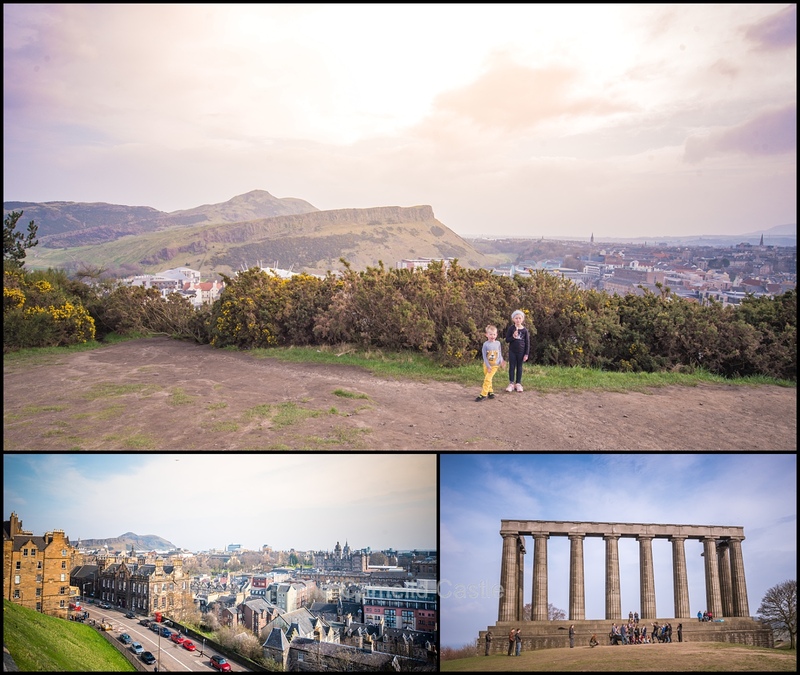 We walked around the top of the hill, checking out the 360 degree views over Edinburgh. There were plenty of other tourists doing the same and lots of people picnicking and enjoying the sunshine. 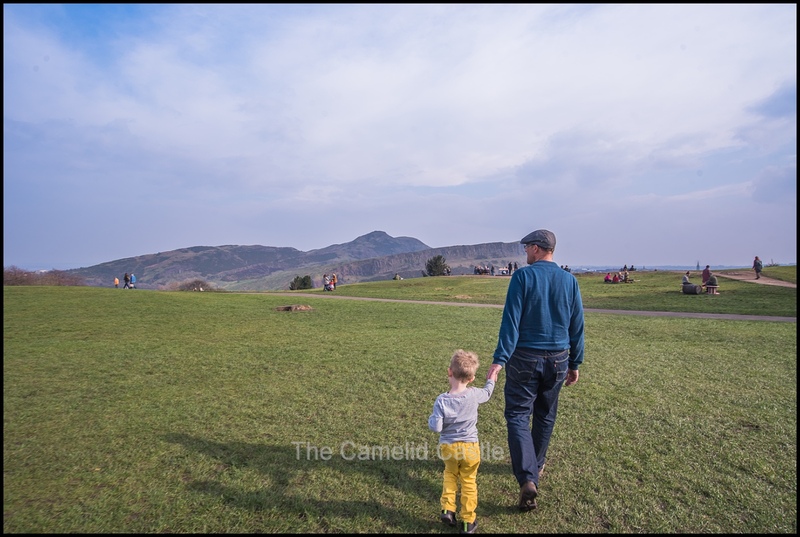 Our original plan was to walk from Calton Hill to Holyrood Palace at the base of the hill and then up to Arthur’s Seat but it was now after 4.30pm so we were a bit limited on time. 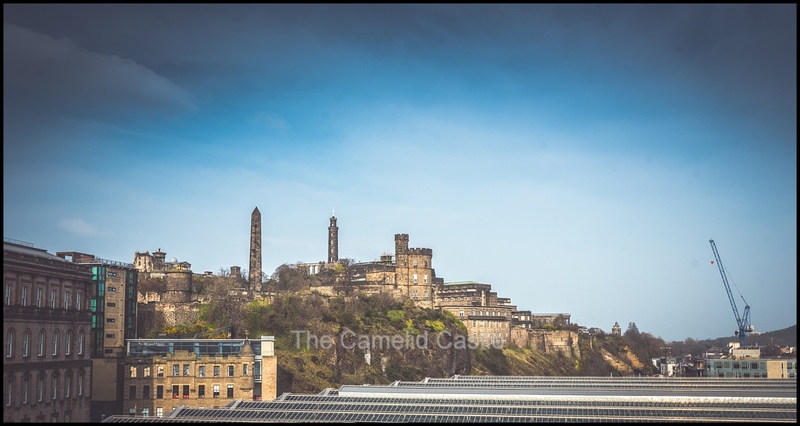 Instead we had to make do with vies of Arthur’s Seat from the top of Calton Hill! 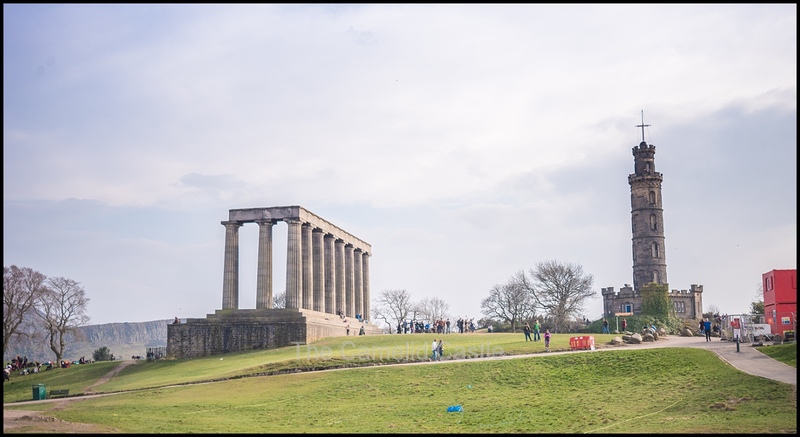 We always knew we were going to be short on time with only a day in Edinburgh, but it turned into only a few hours of usable time. We were happy to have at least seen some of the more iconic spots, if only briefly, and enjoyed the sunshine. A longer look at land marks was going to have to wait for a return visit. 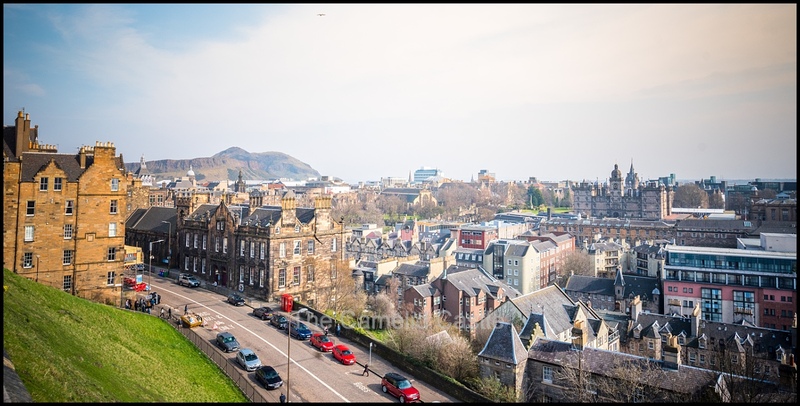 We walked back down off Calton Hill and once again up the Royal Mile, heading in the direction of the car (which we’d now managed to walk several kilometres away from). There was plenty of interesting architecture to check out and seemingly a church about every 10 metres! 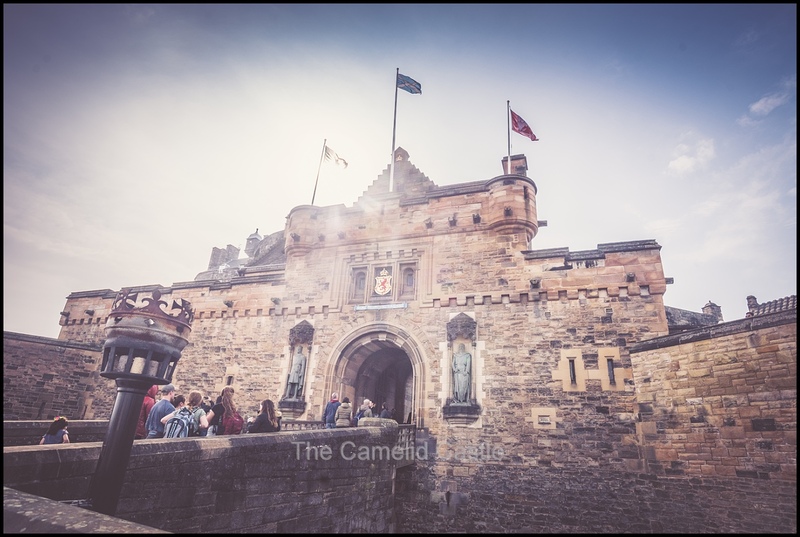 The Royal Mile was again spent trying to the keep the kids out of the souvenir shops they desperately wanted to get into. Everything seemed extremely cheap after Iceland so it was tempting! 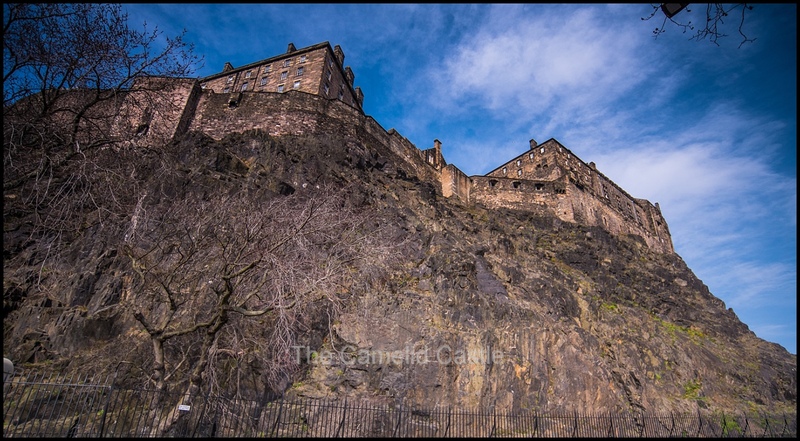 Pretty soon we were walking back past the familiar sight of Edinburgh Castle. Both kids were tiring rapidly and complaining about being hot, tired and thirsty. I guess it had been a long day and 16 is warm after the sub-zero temperatures of Iceland! The adults weren’t faring much better after a long month of travel and we were all pleased to see the car. 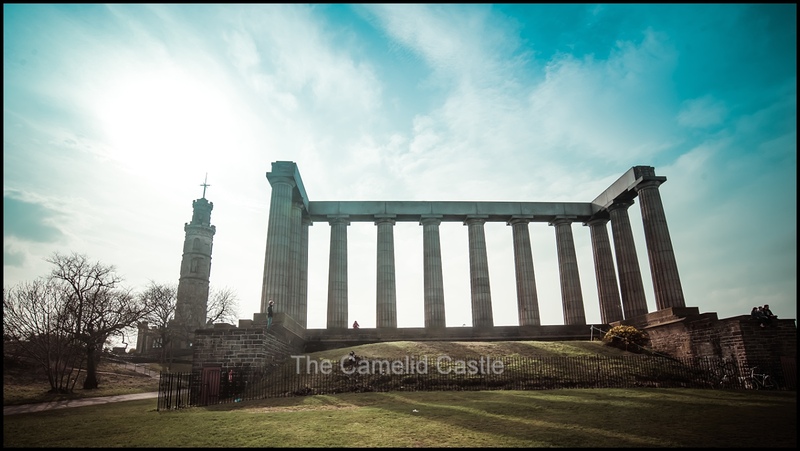 It had been a short visit to Edinburgh, but we always planned to return one day! I was even considering bringing the kids back via the train for a day trip later in the week, if we decided we’d seen enough in Glasgow. It was a little under an hours drive from Edinburgh into Glasgow and we set out around 5.30pm. With the assistance of the GPS we managed to get out of the city without too many problems (GPS seemed to work better than it did in Iceland). An exhausted Soren was almost immediately napping. 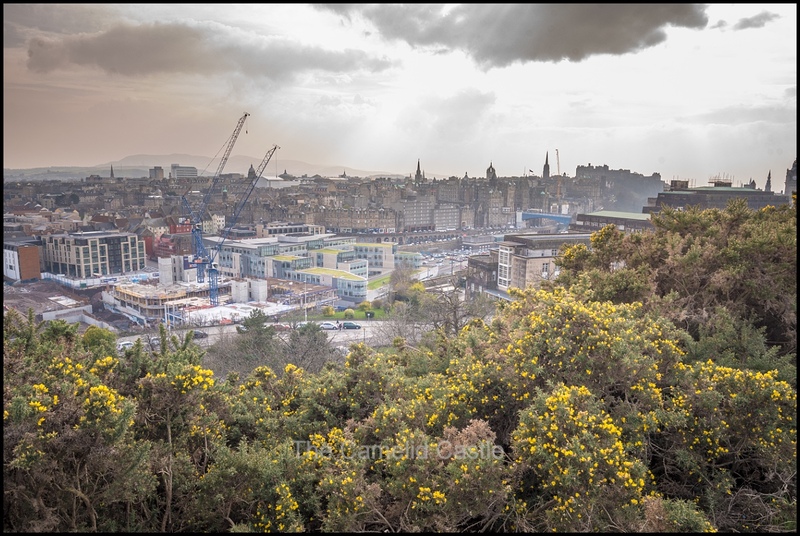 Anto and I concluded that we had almost certainly had the best of Scottish Spring weather during the afternoon, as it was quickly back to 10 degrees and raining. Much more expected weather for this time of year in Scotland! Anto’s work had booked us an apartment for the week in the city centre, not far from George’s Square. We managed to find the street of apartment without much trouble but there was no reception, or seemingly way into the locked building. After a few phone calls, Anto tracked down someone who could tell us how to get into the apartment. Apparently all the information hadn’t been passed on – including the lack of a parking space! We eventually made it inside the apartment at close to 7pm. We had wisely stopped at a service station on the motorway and picked up a few dinner supplies so could quickly feed the kids, even if it was a selection of pre-made salads and sandwiches. The apartment felt utterly enormous after our motor home! Even the bathroom was not much smaller than the entire motor home. The kids eyes lit up at all the space, and they immediately had their belongings spread from one end of the place to another! It had been another long day, after the 6am wake up for the flight out of Iceland it was 9pm before the kids hit their beds for the night. 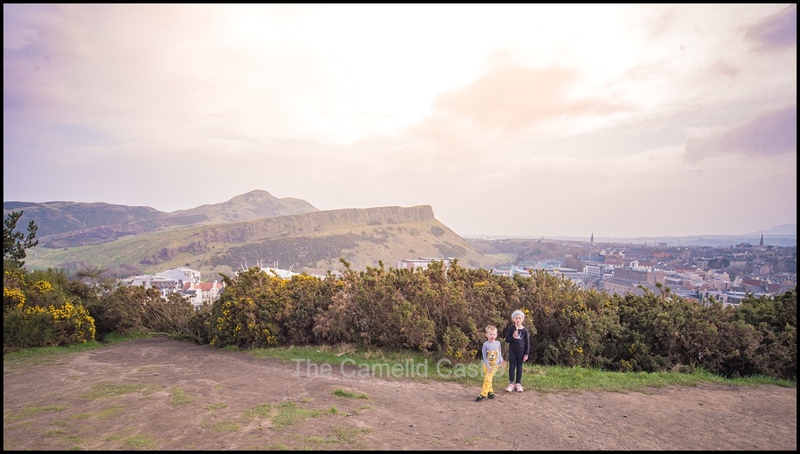 The kids and I were looking forward to a few much quieter days in Glasgow catching up on some rest, while doing a little exploring (with plenty of time for parks). Anto didn’t have the same luxury, with a week of work beckoning. On the other hand he didn’t have to deal with the suitcases of filthy washing I had waiting for me. It had been quite some time since we’d had washing facilities and we were almost entirely out of clean clothes. The joys of travel, when you are excited about a washing machine and dryer…… oh and a queen sized bed and full kitchen. That wasn’t that bad either! Daily statistics for Sunday the 15th of April in Keflavik, Iceland and Edinburgh & Glasgow Scotland – The morning in Iceland started out at a brisk 3 degrees and windy. By lunch time we were in Edinburgh, Scotland at a much warmer and sunny 10 degrees. It made it to 16 degrees as we wandered the city during the afternoon. By the time we made it to Glasgow it was a more expected 9 degrees, with light rain, but we’d still had pretty decent weather for our afternoon exploring Edinburgh so couldn’t complain too much! The total walking for the day was a respectable 11.4km, not too bad when we’d spent the entire morning in the airport and on a plane! 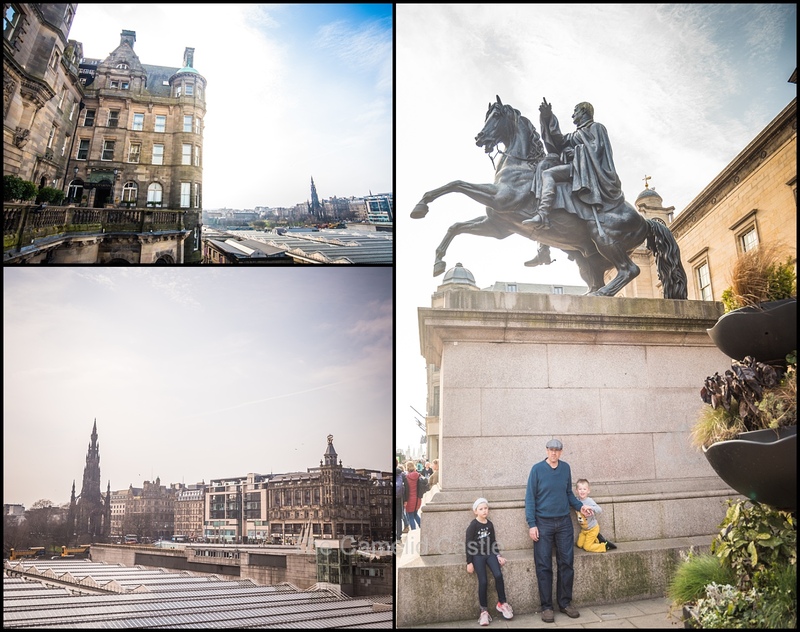 Up next – our first couple of days exploring Glasgow. We found plenty of beautiful buildings, street murals, parks and Spring sunshine and flowers! 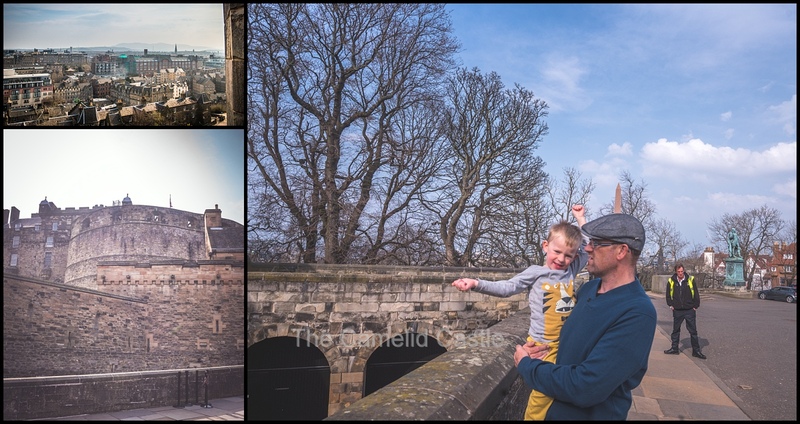 Posted in 4 years, 6 years, Anto, Arthur's Seat, Aruthur's Seat, Astrid, Calton Hill, Castle, Edinburgh, Edinburgh Castle, Europe, Flights, flying with kids, Glasgow, Iceland, Keflavik, kids, Reykjavik, Royal Mile, Scotland, Soren, Spring, Travel, travelling with kids, UKBookmark the permalink.